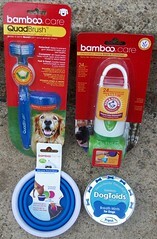 We received some of Bamboo's most popular dog products for review: QuadBrush Ultimate, Silicone Travel Bowl, DogToids and the Disposable Waste Bags and Dispenser. The QuadBrush Ultimate is a wonderful tool - Bamboo has created quite a unique doggy tooth brush. The Patented four bristle heads provide a thorough cleaning, which can help dogs live longer, healthier, happier lives. Three bristle heads surround teeth to clean all tooth surface areas in one motion, while a fourth head helps prop mouth open, softens the bite, and cleans the opposing tooth. QuadBrush Ultimate is available in two sizes - small and large - and three colors - pink, blue and green. It comes with a cover to keep the toothbrush clean between uses (a nice added detail). If you're in the market for a toothbrush for your pooch, be sure check this one out - it's easy to use and the comfort grip handle helps reduce slipping during brushing. The Silicone Travel Bowl is not only portable, it's also collapsible, making it quite convenient to toss almost anywhere - in your purse (or knitting bag), glove compartment, even your back pocket! Made of durable, non-porous materials that are PVC and BPA free, you can feel safe giving your dog water from this bowl. The special collapsible design folds down to less than 1/2” – ideal for travel, parks and walks! It is even top rack dishwasher safe! 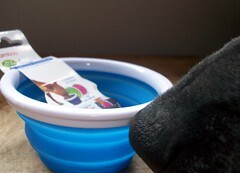 The Silicone Travel Bowl is available in two sizes - 1 and 3 cup - and three colors - pink, blue and green. 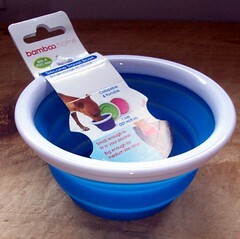 Pictured above is the blue 1 cup version, which is recommended for small to medium size dogs. Although my Lapdogs are more suited to the larger size, this handy bowl will certainly get plenty of use on-the-go this summer! DogToids, the "Ferociously Flavorful" breath mints for dogs, are made from a tasty flavor combination of beef, liver and fish that dogs simply can’t resist. With a little parsley added in, they are a great little dog breath freshener! DogToids come in a stylish round tin that you can keep on the counter, in your bag, in the car or almost anywhere. Just toss it in your doggy bag and off you go! 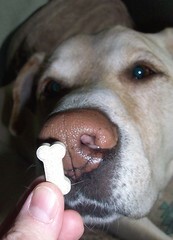 The "treats" are even fashioned in a most adorable bone shape - ensuring you won't mix them up with your human mints! 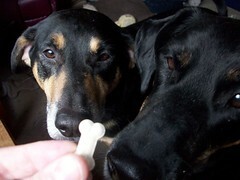 The DogToids were well accepted by all of the Lapdog taste-testers - they crunched them right up and asked for more (perhaps they look at them as "candy")! The fact that they are made in the USA with high quality, human grade ingredients is that added bonus that I'm always searching for. Bamboo's Disposable Waste Bags and Dispenser is a fresh and easy way to pick up after your dog on the go. The disposable waste bags have natural odor elimination from Arm & Hammer Baking Soda and the unique dispenser design easily attaches to any leash, bag or belt loop. Choose from pink, blue or green durable bags; 24 are included with the dispenser and refills are available for purchase. Don't be caught without a bag in hand again - keep the Bamboo dispenser clipped to your leash and you'll always be ready for whatever your 4-legged child surprises you with! I so need a collapsable dog bowl. My boy gets so worked up at the vet and is always thirsty and I never remember a bowl for him. I usually just pour water into my hand and he drinks it that way. That bowl would just stay right in the car. 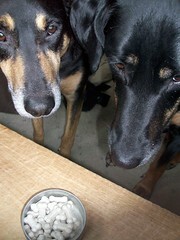 Love the doggy mints - how much fun are those? the travel bowl appears to be too small for Beau to immerse his head in, so . . . The travel bowl is awesome, although likely too small for poor Thor's nose. And he could use those Dog Toids some days! Patrick was going to feed him Altoids the other day, or so he said. He fed Thor a cookie instead. We love Bamboo products at our house. We have a collapsible bowl that we use whenever we travel. 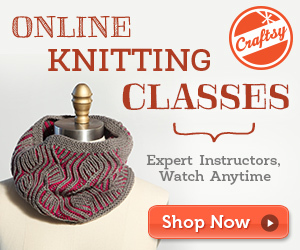 We can stick it in a pocket for long walks or trips to dog events. It goes on the boat with us and in the car. Actually we should get another to leave in the car.